Chris Booker is passionate about two things: the sea and steel. He once worked as a welder for a Navy contractor, and recently, he used his skills to design some of the stainless-steel architectural pieces featured in the Ozarks’ newest attraction – the Wonders of Wildlife museum. After Polar Tank Trailer, Inc.’s permanent closure in 2016, Booker was out of a job and in need of a change. Utilizing a government subsidy after the layoff, he enrolled at OTC to earn an associate degree in drafting and design. His decision paid off. In April, he was hired as a field operations designer at Paul Mueller Company, and he was immediately tasked with designing stainless steel installations for the new Wonders of Wildlife museum. Of the four structures Paul Mueller Company designed that are now inside WOW, Booker explained that he was asked to compile the engineers’ ideas and sketches into detailed, technical drawings to be used in the manufacture of three of the stainless steel frameworks. He noted that his designs had to be mindful of how the fabrications needed to be broken down. Booker’s tanks are in key locations throughout the Wonders of Wildlife museum. 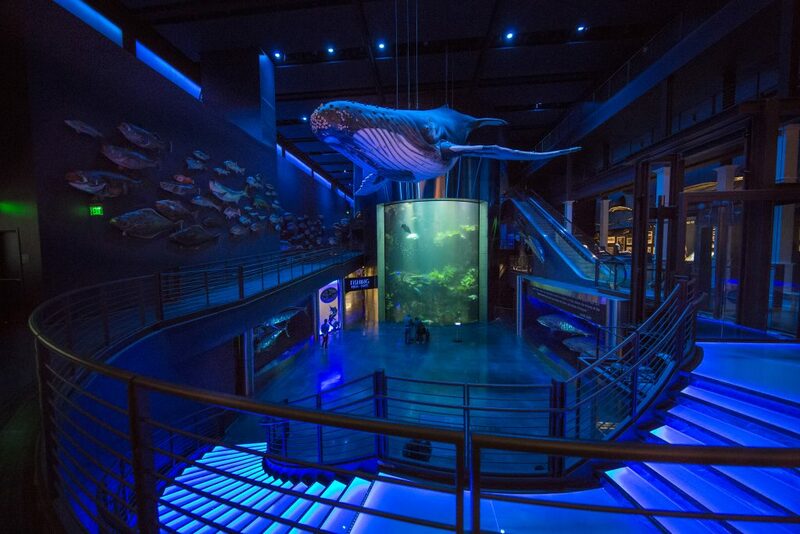 One installation encompasses the marlin diorama; another features tiger shark replicas. His last creation is a large, steel curved wall below a lit staircase that descends upon a large section of the museum. Sitting above the wall is another diorama with a life-size great white shark. Chris is proud that he played a role in the construction of the museum. “Wonders of Wildlife is already such a well-known attraction in Springfield. It’s neat to think that I played an active role in its design process,” said Booker. Booker graduated from Reeds Springs High School in 2008 and enrolled in Gibson Technical Center to obtain certificates in automotive technology and welding. After Gibson, he moved to Gulf Shores, Alabama and earned another certificate for fabrication and quality while working with a United States Navy contractor, Austal U.S.A., to fabricate prototype attack vessels. A part of his job was to coordinate between both the fabrication and drafting departments and this is what first interested him in the drafting trade. It was this idea that led him to OTC years later. Although working in the trade has been beneficial, Chris believes that without OTC’s extensive classwork and hands-on experience, he wouldn’t have the foundation on which to build his career. He also thanks the drafting and design staff for their expertise and encouraging words throughout his time at the college. He plans to graduate from OTC in August of 2018 with associate degrees in drafting and design and manufacturing technology. He plans to continue his education at Southern Illinois University to obtain a bachelor’s degree in industrial management.